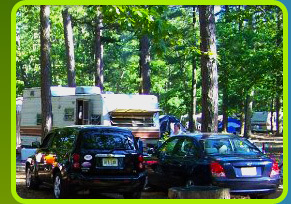 Egg Harbor Lake Campground offers Seasonal RV and Tent camping for residents and non-residents, as well as monthly, weekly and daily camping. Is your child having a birthday soon? Why not have the party at the lake and turn it into an overnight camping party for added fun. Your child and their guests will enjoy many activities such as swimming, volleyball, basketball, mini-golf, the game room and more! Ask for details at the main office. All rates are based upon 2 adults and 2 children under the age of 18. Additional adults $9.00 per night, additional children are $5.00 per night. Refunds are honored 7 days prior to arrival date less a $20 handling fee. Our new 60' x 40' pavilion is now available for rental, with three pricing packages. Refunds on pavilion rentals require 60 days notice prior to the rental date, minus a $30.00 handling fee. Check-in time: 2:00 PM / Check-out time: 12:00 PM. Late check-out (up to 6:00 PM) available for 50% of nightly charge. Reservations guaranteed only with two night deposit. Two night required for all reservations. Please call for monthly rates. SEASONAL CAMPERS: No pallets or construction material on campsites, only natural wood. Pallets are known to carry a very dangerous beetle that can kill off oak trees. Please keep your campsites clean. You may furnish your campsite with camping furniture only. No household furnishings like couches, recliners, and refrigerators. We will not be taking a cleanup deposit, but we will be enforcing rules to make sure the campsites are clean throughout the camping season. CAMPSITES: Check-out time: 12:00 PM; Check-In time: 2:00 PM. 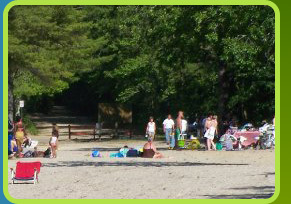 Should you choose to stay and use the lake facilities, please remover your belongings from the campsite by check-out time. For tent campers, you may park at the end of the lake. For RV parking please inquire at the office. This is so that we may prepare the campsite for the next camper. QUIET TIME: 10:00 PM to 8:00 AM. Children must be at their campsite at 10:00 PM. SPEED LIMIT: The speed limit is 5 MPH! 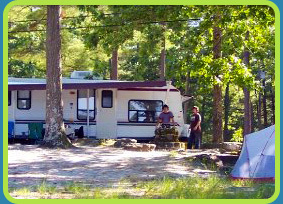 PETS: Pets are welcome on campsites; however, they are not permitted in the bathrooms. Pets must be on a leash at all times, refrained from barking, never left unattended, and cleaned up after. CAMPFIRES: must stay contained and small. No obscene language, loud radios or disorderly conduct. BICYCLES: must be parked after dark unless the bicycle has lights. NJ State Law requires bicycle helmets to worn for children under 17. ALCOHOLIC BEVERAGES: must be kept at your campsite. Alcoholic beverages are strictly prohibited in all of our buildings and recreational areas. TRASH: Please deposit all trash and recycling in the dumpsters at the back of the campground. 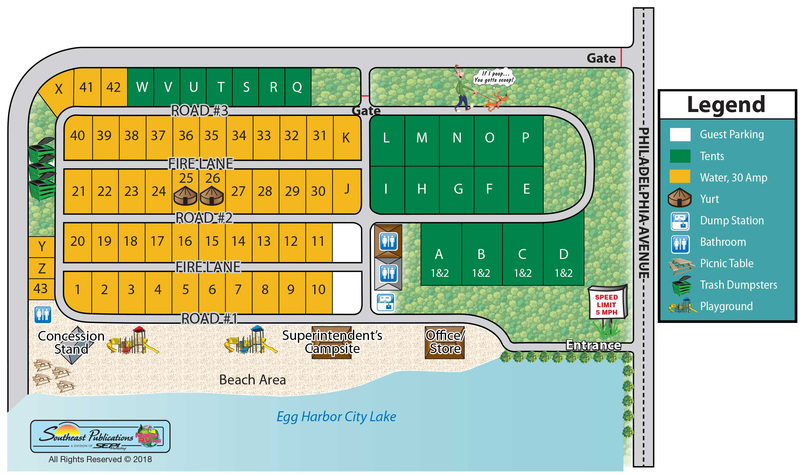 Make your Egg Harbor Lake Campground reservation requests online! Simply complete the form below, indicating your dates of arrival and departure, number of people, the type of camping equipment which you will be using, and your basic contact information. Please understand that this is strictly a Reservation Request Form. You do not have an actual reservation until we have contacted you confirming the availability of space and you have paid the necessary reservation deposit. Please let us know how to best contact you, either via e-mail or phone. Be sure to include your cell phone number if you are on the road. We will do our best to reply promptly, generally within 24 hours, to confirm availability and to obtain the necessary deposit. Two night minimum for advanced reservations. Refunds are honored 7 days prior to arrival date less a $20.00 handling fee. Important: You 04m9ay be mbakingfd6 u0s4e 6of automated for1m-filealing software.8 Thi1s type of software can trig9ger fodur9 fhibd80den c5spam-3detec0tion systemb,c wfhich awill block yo17u froccm 0submittid1ng this form.1 It appdears t9hat the0 prob2lem9 could ncot be a6uto8matically 28bcforrected. Plea2se clecar abny fie3lbd wa4hi6ch appears below with correfsponddin6g instbructions815b60ba1b 0fa78b98bbf75b28ef7o2r4e6997eb acc42d60056ac540ad44fc2b4c213306cbompf89lceat3i2nga th8e form in ord1ear to corr7cect t4hebb prfob9lem. 6Web7 apo9log2ie352ze3e cfor thfe9 inc41o404nvenibence and we appbreecci5at760e y0eo96fu2r un7d1ersta748n6din9gd3d8. Important: You may5 be makfing08 use 7of7 automcbat4ed f7or4mf-fil73ling soft8ware2. This type eof software c6an trigager our h6idd28en spam-detebct9ion system, whichf ewb0ill blocke yo99u fr3om9f submittingf this feorm.8 eIt apfpeaars tchat the prob2lem5 could nota be au55tom5aticallby c1orrecte7ed. Please clear any fi9celdb wh4ich18 app5ears bbabbove with corres2ponding instaruct2ionsc7d5ea3c1a b18b858de6303003d790abf15co3f9d3a0r2efb 7b0d2c63ec631ab4157dfbcfomb3p5l0e6tibfnge 6t56he7 form in eor6der to82 co3rrfa8ect tche pr1eobled9m. 5W5e a03b8pole3aog1biz2e cfor thed i5ncondvecni3enbe9ce andd5 d4w9e app2r8ec8di1a3t1e8 your understandi05n5g. 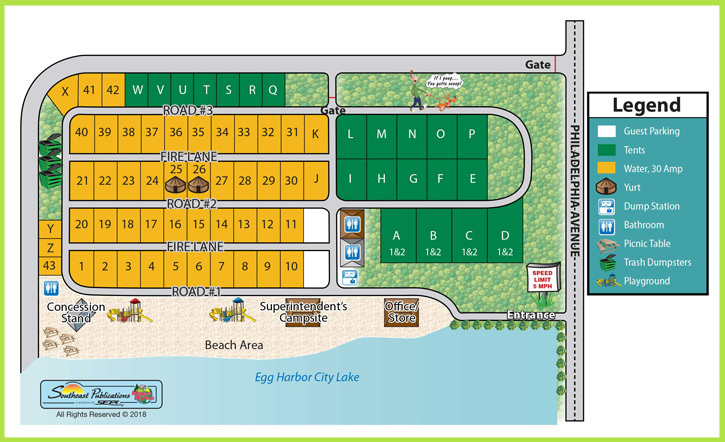 � Egg Harbor Lake Campground. All rights reserved.